The history of the Richardson Highway is rooted in the days of the gold rush Work was underway in Valdez to establish a trail from that port to Eagle on the Yukon River, so that Americans would not have to pass through Canada to reach the gold camps in the Middle Yukon River area. When the Alaska Road Commission was established in 1905, Major Wilds P. Richardson was its first president. He assigned top priority to upgrading the Valdez-Fairbanks trail. By 1907, it was developed to a wagon route and a stage plied the trail with horse-drawn sledges in winter and wagons in summer. The highway eventually came to be named for Richardson, who had promoted the improvement of the original trail. Today only a few of the old roadhouses still stand along the route. They were established about a day’s journey apart which was usually 30 miles or less. Today, it feels to the Alaska Highway traveler that the road to Fairbanks from Delta Junction is part of that long journey that started at Dawson Creek. Fairbanks says it is at the end of the highway, but the familiar mileposts end at 1422 at Delta Junction. 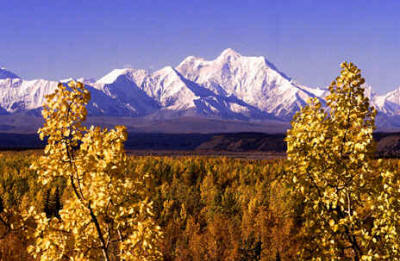 As one drives north from Delta, the numbers start at 266, numbering from Valdez, the start of the Richardson Highway!